Sydney Spectaculars – Your unofficial source on all Sydney fireworks/projections news and history! It is the blog this time. This blog had to end sometime. We also want to leave on a high. Over the past 18 months, we have published articles speculating the end of the 2 main ‘Sydney Spectaculars’: Vivid Sydney & Sydney New Year’s Eve (NYE). We also made a Facebook post questioning the creativity of Sydney New Year’s Eve nowadays. All of these combined make us believe this is the ‘peak’ of Sydney Spectaculars – the 2017 editions of Vivid Sydney & Sydney New Year’s Eve. Our Vivid Sydney article came true this year with the 1st ever drop of attendance in Vivid’s history. It was less of a drop than we predicted (prediction – about 1,000,000; actual – about 20,000) but nevertheless, it was the first ever attendance drop for Vivid Sydney. Sydney NYE has also had it’s attendance drop by a million since 2013. However, we believe that was due to reasons not related to the popularity of the event. As we wrote in our article, with the rapid ticketing of the event this year and the potential ‘full’ ‘commercialisation’ of the event possibly into the next few years, Australian taxpayers & Sydney ratepayers though may question their funding of the event leaving the future of the event in the balance as these people will likely want to be able to enter an event they are funding for. The media launch of Sydney NYE2018 – The Pulse Of Sydney a few days ago also revealed a massive budget decline for the event. Last year was AUD$7 million, now it is AUD$6 million – a drop of about a million Australian dollars. Some of that drop can be attributed to the cancellation of the Very Important Person Viewing Area at Hickson Road Reserve this year. Whilst what we published in our article is concerning for the event’s future, there is a possibility that most Sydneysiders won’t realise what we detailed in the article until the morning of the event prompting anger from Sydneysiders who thought that access to most of the good vantage points were still mostly based on who arrived at the location first – not who reserved tickets first. They might then realise that there are not really any good vantage points left to access (even though there are still vantage points left to access) further accelerating that anger especially since they planned a day of looking a good view. Some might even just give up and go home and watch it on television or the Internet. And that anger might mar this year’s event. In the end, it depends on how many Sydneysiders attend the event on the day and how aware they are of the newly ticketed vantage points. Regardless of what happens, we do not want to write articles about the slow decline of these 2 major events. We provided warnings in the form of our 2 articles and it’s up to the City Of Sydney & Destination New South Wales to respond accordingly. In 2016, we were in the midst of writing a warning about the potential of a crowd crush disaster at Vivid Sydney, when that exact thing occurred. Thankfully, no one was seriously injured. So our warnings should be heeded. We don’t want to write an article every few months stating ‘Vivid & Sydney NYE have problems. Fix them before it’s too late. Don’t know how? Here is our advice’. Most of all, we don’t want to have to write an article saying ‘The party is cancelled…permanently…again’ or ‘The lights are off…permanently’. That would be a sad day. But a good reason to stop writing articles is that it frees up room to upload more historical footage of these events. Viewing historical footage of these events is what most visitors do our blog so we’ve decided to turn our site more into a ‘museum’ of the ‘Sydney Spectaculars’. For starters, we will slowly move the videos on our YouTube channel (which eventually we will remove) to this website & of course, add this to this website videos of this and future year’s Sydney NYE, Vivid Sydney & other ‘Sydney Spectaculars’. We will update each event edition’s page with new information when it is available instead of posting the media releases in full from now. So, for this year’s Sydney NYE only, we will provide updates on that event edition’s fireworks soundtrack page as well as by posting on Facebook a direct link to the media releases as they arrive. Every other edition of a ‘Sydney Spectacular’ will have updates on their event edition’s page only. There is a chance there will only be 2 pyrotechnic displays in Sydney NYE for the 1st time since 2007 as fireworks are not mentioned in the descriptions for the Welcome To Country/Indigenous Smoking Ceremony at 7:30pm or the new Calling Country immediately after the 9pm Family Fireworks. There is a high chance the 10 year Royal Australian Mint partnership with Sydney NYE to produce a yearly Sydney NYE coin has ended after 5 years. The coins are usually revealed in early November (except in the 1st year when it was revealed at the event’s media launch). If the coin isn’t revealed on December 31st, that pretty much guarantees these coins have ceased being minted. There may be more information (which if there is, we will publish here) but we are pretty confident the rest was covered in the media launch a few days ago. And, for the record, no information about the fireworks soundtracks has been revealed yet. In the future, we will also still answer all questions that you send to us. Again, apologies to all our Sydney Spectaculars followers for not posting any stories and responding to queries received over the past 9 months. We will respond to the queries received over the past 9 months shortly. Lastly, we want to thank all our followers. It is nice to know there is an audience out there who consider Sydney NYE as more than ‘just a fireworks display’. The blog wouldn’t have been worth writing without you all. From 2011, when we began as a YouTube channel display historic footage of Sydney NYE, your requests for information about the next year’s theme, fireworks soundtracks and more led to the creation of this full blog, which coincided with the addition of Vivid Sydney and an expansion of the meaning of what can be considered as a ‘Sydney Spectacular’. This made the blog an all-year exercise. Whilst we know you are all still enthusiastic about the events, we believe the events are about to begin a decline and that’s why we believe it’s a good time to finish blogging. We don’t want to write, over many years, the decline of these events. If the ‘Sydney Spectaculars’ are on the way up again, the blog may resume in the future…maybe. So we are still hoping things will improve. To conclude, we hope you all have a happy new year! Sydney Harbour will come to life on New Year’s Eve with a five-minute mini-movie animation inspired by the Aussie music anthem, ‘Great Southern Land’. Created with award-winning Australian pop duo, Client Liaison, the new music moment at 11pm will see the Sydney Harbour Bridge pylons illuminated with Australian beach scenes, the outback and a dramatic setting sun. The original song ‘Great Southern Land’ was a huge early ’80s hit by rock group Icehouse, evoking the Australian landscape, heritage and identity. 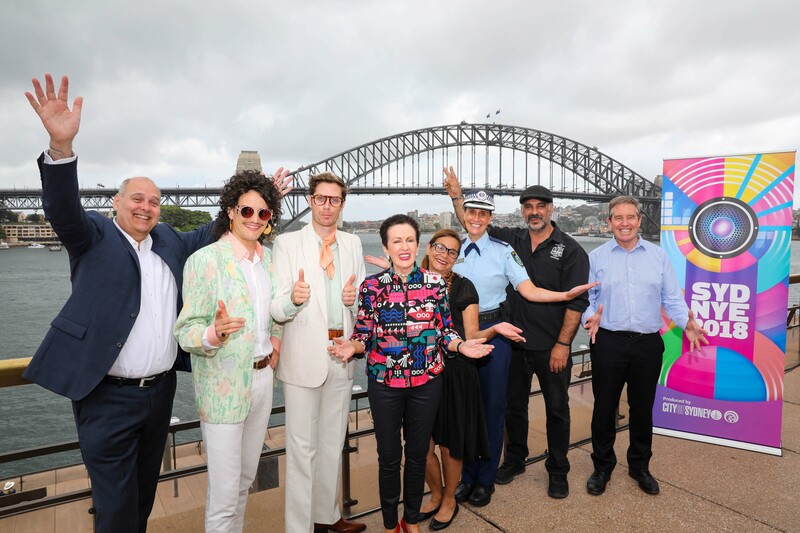 Lord Mayor Clover Moore today announced the theme of New Year’s Eve 2018 – ‘the Pulse of Sydney’. “Every New Year’s Eve, the world watches as Sydney becomes the first city to ring in the New Year,” the Lord Mayor said. “No other night reflects the pulse of Sydney quite like New Year’s Eve – with more than one million people coming together around our beautiful Sydney Harbour and more than one billion people celebrating with us worldwide. As the animation plays on the bridge, Client Liaison will perform ‘Great Southern Land’ as part of the ABC New Year’s Eve concert, The Night Is Yours, at the Sydney Opera House. This will be broadcast on the ABC and live-streamed on sydneynewyearseve.com. 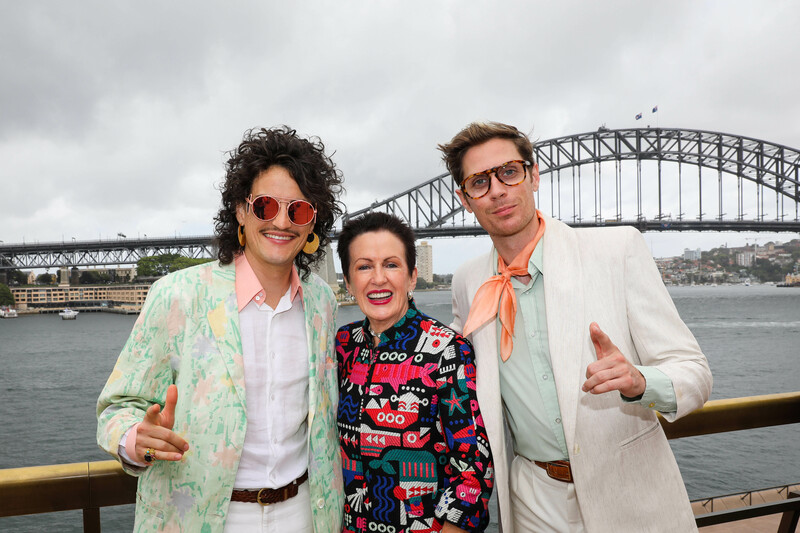 Client Liaison’s Monte Morgan and Harvey Miller described the Sydney New Year’s Eve collaboration as a creative dream. “No city on earth does New Year’s Eve like Sydney. To be part of this amazing night as musicians is incredible. To have a creative role as artists is an absolute buzz,” said vocalist Monte Morgan. “We had so much fun helping create the Australiana animation, and I can’t wait to see our concept beamed on the biggest and most beautiful canvas you could ever hope to have,” said keyboardist Harvey Miller. Not to be outdone, the fireworks displays at 9pm and midnight will include never-before-seen fireworks effects, with more fireworks than ever before. This year, more than 8.5 tonnes of fireworks will be used to create dramatic displays across Sydney Harbour – 500kg more than in 2017. There will be 35,000 shooting comets – 5,000 more than last year – and 13,000 shells lighting up the night with never-before-seen firework effects. Fireworks director, Fortunato Foti, revealed there will be more than 100,000 individual pyrotechnic effects on the night, with 1,000 more effects shooting from the Harbour Bridge this year. “Our ‘pulse of Sydney’ theme has inspired new fireworks effects. For the first time we’ve created pulsating fireworks that you’ll see in dramatic new star shapes,” said Mr Foti. “We’re also introducing wave effect fireworks, where the colour moves across the display rather than the traditional explosion from the centre of the firework. An age-old Aboriginal tradition of Calling Country will see Sydney mark the International Year of Indigenous languages in 2019. The Calling Country ritual will welcome all to Sydney and Gadigal land. The ceremony will be captured in a series of stunning animated projections, including water, birds, fish and plants beamed onto the Sydney Harbour Bridge pylons. Sydney New Year’s Eve creative director, Rhoda Roberts AO, said the cultural protocol “has been updated for the 21st century”, with real significance for the new year. “UNESCO has named 2019 the International Year of Indigenous languages, so I think it is fitting that we end our new-look welcome in words of the Gadigal we can all embrace,” Ms Roberts said. The Sydney New Year’s Eve event is included in the scope of greenhouse gas emissions measured and offset by the City as part of its annual assessment. Sydney New Year’s Eve fireworks are manufactured from biodegradable paper and compounds that dissipate after use to minimise the environmental impact. We also draw on improved technology, energy saving LED and low wattage lighting. ABC is thrilled to announce that once again Charlie Pickering and Zan Rowe will be counting down to 2019 when they host ABC’s New Year’s Eve coverage live from the Sydney Opera House, featuring a star-studded concert. Joining the musical line up will be talented all-rounder Tim Minchin, pop singer Christine Anu and the original Daddy Cool Ross Wilson. They will star alongside internationally renowned singer-songwriter Ben Folds, Aussie rocker Daryl Braithwaite, Casey Donovan, Isabella Manfredi (Preatures), pop duo Client Liaison, Indigenous Hip Hop artist Baker Boy, soul singer Kaiit and drummer extraordinaire turned solo artist, G Flip. As well as their favourite songs, our performers will be singing songs from a party playlist that’s been voted for by the Australian public. With special guests appearing and the sensational midnight fireworks over Sydney Harbour, capping off the night, it’s going to be a night not to be missed. Now firstly, to be clear, not all the vantage points of Sydney New Year’s Eve (NYE) are sold out or reached capacity already. Just mostly the good ones. This year has seen an expansion of ticketed vantage points that now see some of the most iconic views of the event now sold out over a month before the event is held. These views include areas where you could choose a spot to sit on the morning of the event. Some of these ticketed areas aren’t paid areas too. That is, it is free of charge but you can still book a ticket. So, this Sydney NYE, where were you planning to watch the fireworks from? Yeah, same as that last one – sold out. Wait!!!! So where can I watch the fireworks???? The remaining spots are either very far away, got poor views, got very limited space of good views or cost heaps for a ticket. This year, 2.5 of the 7 kilometres of Sydney Harbour foreshore that provides a perfect view of the Sydney Harbour Bridge will be non-ticketed. This location has a capacity of 4500 people and last year, reached capacity at 2pm. Given the lack of good vantage points, this could reach capacity earlier this year. …and the Sydney Opera House, which has a capacity of 7000 people and last year, reached capacity at 1pm. Like with Mary Booth Lookout, we expect this area to reach capacity earlier this year. This one particularly due to East Circular Quay being sold out already. So what’s wrong with the other vantage points? Well, using the Sydney Opera House for starters, the only free sections are in a small corner on the north-western side of the Northern Forecourt and most of the Southern Forecourt. Despite being a free vantage point, in the past decade, most of the Sydney Opera House has become ticketed. Most of the Northern Forecourt is now home to a paid ticketed concert for the Australian Broadcasting Corporation’s broadcast of Sydney NYE. However, proceeds from ticketing go to charity. The actual building is used for paid ticketed events. The western side of the Sydney Opera House is mostly home to paid ticketed functions. And obviously, if you are on the eastern side of the Sydney Opera House, you cannot see the Sydney Harbour Bridge. You will still see 3 barges of pyrotechnics, which whilst it is impressive, it isn’t what you went to the event for. You went for the Bridge. Ok. So what about Mrs Macquaries Point? That is mostly covered by trees or facing away from the Sydney Harbour Bridge. Again, only a very small portion of that Point has a good view of the Sydney Harbour Bridge and that is right on the tip of the point. The whole western side of the Point is now mostly paid ticketed functions & these aren’t covered by trees. Queuing up overnight outside the Art Gallery Of New South Wales (NSW) for this vantage point has happened for a long time but since the paid ticketed functions were introduced, getting a good view at Mrs Macquaries Point is more prized because only a few would get a good view. Dawes Point – Sharp angle of Bridge & very crowded. Bradfield Park – Very sharp angle of Bridge & very crowded. The Rocks – Buildings cover most of view & very crowded. First Fleet Park – Crowded but you can’t see the Bridge at all. Circular Quay Promenade – If you want to see a ferry terminal instead. Cremorne Point – The lower half of the Bridge is blocked by the Kirribilli headland. If you want to see the iconic waterfall effect, don’t go here. From here, you will see most of the fireworks from the Bridge & from a couple of barges though. Royal Botanic Gardens – (Paid) Ticketed and mostly good views. Good view of Bridge only if Sydney Opera House doesn’t block view. What about the vantage points west of the Bridge? The eastern side of the Bridge is the ‘show’ side of the Bridge. Most things happen on the eastern side of the Bridge so you’re very likely to miss a lot of entertainment on the western side of the Bridge. This doesn’t mean the fireworks won’t look spectacular – they just won’t be as good as compared to the eastern side. Given Blues Point Reserve is now paid ticketed, vantage points in the town of East Balmain are now your best free option on the western side of the Bridge. However, they are not as iconic as Blues Point Reserve and have no view of the Sydney Opera House. Are there more good vantage points on the east of the Bridge? No…unless you are prepared to pay or want a distant view. The best location far away from the Bridge is Bradley’s Head but all that is paid ticketed. Strickland House has an iconic view (It is used in the television broadcasts). However, it is no longer an official vantage point & to watch the fireworks from there requires a paid ticket. So, yeah, pretty much every good vantage point is gone. Only about 12,000 lucky people will get a good free vantage point on the day. Ok. Well, I’m going to Mary Booth Lookout for NYE2019. Hang on. Sorry, to break the bad news, but North Sydney Council is currently considering making all of it’s vantage points ticketed. So far, it is just Blues Point Reserve this year and that is just a trial. Also, Balls Head Reserve has been closed to the general public this year (NYE2018) due to environmental concerns. Anyway, Mary Booth Lookout is a North Sydney Council vantage point so there is a fair chance that will become ticketed for NYE2019 (and maybe further into the future). Well, then Sydney Opera House. The latter 2 being 2 of the newly ticketed vantage points this year. Cahill Expressway has been free ticketed ever since it was first used as a vantage point in 2005. However, you need to be a NSW resident to enter the ballot for a ticket so there is a barrier to most of the general public but that is reasonable given nearly all NSW residents own the road (The NSW Government’s Roads & Maritime Services own the road). The ballot is also publicised very well every year. The latter 2, whilst being open to everyone, weren’t publicised well. Despite a Property NSW (owner of those vantage points) spokesperson responding to our queries by saying they will “reach out to key publications for coverage”, their media release webpage shows no media releases publicising these tickets going on sale on the 6th of November, which would show their seriousness in promoting the newly ticketed vantage points. Simply contacting random publications, which could have happened based on that quote, wouldn’t be as serious. To compare, North Sydney Council who controls the now paid ticketed Blues Point Reserve, issued a media release that got reported in a few newspapers. No newspapers have reported East Circular Quay & Campbell’s Cove becoming ticketed. The ticketing will be promoted via the City of Sydney’s New Year’s Eve website. Property NSW will also promote the New Year’s Eve precincts via multiple consumer- facing channels, including The Rocks website, social media and electronic direct mail. However, these would have reached only 2 major interest groups – tourists & people who have a great general interest in The Rocks and/or Campbell’s Cove and/or East Circular Quay. There is no effort to promote these vantage points becoming ticketed to Sydneysiders in general. You know, the people who are so accustomed to Sydney NYE being a non-ticketed event at East Circular Quay & Campbell’s Cove. At least North Sydney Council made an effort to let Sydneysiders know that Blues Point Reserve will become paid ticketed. A review of the ticketing system will be undertaken post NYE 2018. No decisions have been made regarding paid ticketing for future events. These areas have become ticketed to improve customer experience, manage crowd numbers and improve safety. But that’s the thing. Ticketing doesn’t improve it. For many years, managed access (bag checks) have been done, capacity limits have been enforced and there isn’t anything different about the vantage points themselves on the day than what they will be like this year. All that is different now is that you need to book a ticket 2 months in advance. Why? Other reasons that make it odd to add more ticketed areas include that the attendance of Sydney NYE has been declining by a million people in the last 5 years and the official organisers of the event, the City Of Sydney, actively try to reduce attendance due to the large crowds the event creates. You might as well consider Sydney NYE fully ‘commercialised’ if that happens. If that happened (the Sydney Opera House & those 3 free ticketed vantage points becoming fully paid ticketed vantage points), it will be impossible to get a good view without paying hundreds or thousands of dollars. And if you don’t have to do that, booking a ticket months in advance. And if you miss out on a ticket, expect poor views and/or a very far away vantage point and if you are close to the Harbour Bridge, ultra crowded locations – not just during the fireworks but all day – with limited views. Can you imagine being squashed in like sardines in the middle of The Rocks all day? It’s reasonable to expect then that if North Sydney becomes fully ticketed, the “flow-on effect” will go somewhere else. Highly likely, this could be East Balmain or Dawes Point (the latter of which could also “flow-on” to The Rocks). Sydney New Year’s Eve, at it’s core, is a City Of Sydney event. An event run by a local government. And not just an event, a community event. If Sydneysiders have to face a barrier to access an event they are already paying for, this could be the tip of the iceberg. Sydneysiders may refuse to allow their rates to go towards this event. If the City Of Sydney refuse to pay for this iconic event, things will get problematic. City Of Sydney holds the rights to the event & even some copyright. They may grant a license to another entity to use their rights for a given period to run the event. This would bring in some extra revenue for the local government. The most likely entity to pursue the rights are the NSW Government. However, the same problem arises. Why should Australian taxpayers (NSW doesn’t collect taxes – they receive most of their income from the Australian Government, who receive that income as tax from Australian taxpayers) pay for an event that has a barrier to access the event for the people paying for the event? The next likely entity is a commerical operator. Imagination, the current creative directors of Sydney NYE, could maybe end up organising the event themselves particularly after their work doing the International Fleet Review Spectacular in 2013. However, the event will have to rely completely on sponsorship unlike currently, where governmental funds make up a fair portion. If sponsors can’t promote their brands to a large community audience, the sponsorship value of the event may plummet and there will be no Sydney NYE anymore. Last year, we predicted Vivid Sydney will reach a peak this year and that came true with it’s 1st attendance decline ever. We’re now predicting the commercialisation of Sydney NYE will destroy the event in the next few years. ‘Sydney Spectaculars’ (not our blog) is at it’s peak so enjoy it while it lasts. It’s been an amazing 2 decades. The growth of the ‘Sydney Spectaculars’ reminds us of the Roaring Twenties. Maybe we are approaching October 1929? If you thought that was a sad idea, then get ready for this: Earlier, we mentioned that North Sydney Council is thinking of implementing paid ticketing at it’s vantage points. As mentioned earlier in our article, Blues Point Reserve has become a paid ticketed vantage point as a trial. Originally, North Sydney Council staff recommended that the Blues Point Reserve ticket price be in order to make a profit (with the profit going to fund the other non-ticketed vantage points of theirs) but North Sydney Councillors (all Independents) said no, the ticket price must be in order to just break-even, which is the price that has been implemented. The Councillors did, though, accept the staff recommendation that Balls Head Reserve should be closed as a vantage point this year due to environmental concerns. The North Sydney Councillors also resolved to get their staff to develop a community engagement strategy and a report outlining revenue generating opportunities & cost recovery strategies for NYE. This was back in late May this year. Advantages: This option is suitable for some sites and transfers organisational responsibility to third parties. Under this option, some Council venues would be managed as third party sites following the same principles as other existing third party events such as Spring Cycle and the Sydney Running Festival. Disadvantages: Council would receive less income than it would from individual ticketing and would have less control over the style and price of event offered. While some organisations may want to lease land to provide a special experience for their customers or staff, it is likely that most would want to run a high-cost ticketed event to cover the cost of land hire and event operations. Council staff would be need to coordinate any NYE third party event as they do for existing third-party events on Council land and the land area outside the venue. Now, this isn’t the recommended option. That is just plain ticketing. The ticketing option has been taken to community engagement, which finished this month. The Community Engagement Strategy that was requested in May was also delivered with the report mentioned earlier and the community engagement tried to follow that Strategy. However, what if the North Sydney community reject ticketing of their vantage points? The next preferred option, according to North Sydney staff, is sponsorship and the report doesn’t make it clear whether ‘sponsorship’ can be combined with the option detailed above – the ‘corporate box’ option. We call it the ‘corporate box’ option because that’s essentially what it is: Vantage points essentially ‘given’ to corporate organisations “to provide a special experience to their…staff”. Can you imagine Commonwealth Bank at Blues Point Reserve, Facebook at Mary Booth Reserve and Telstra at Bradfield Park? This may be a step too far especially after last month’s The Everest Barrier Draw controversy. Even if they don’t use the vantage points for their staff or customers, North Sydney staff believe “it is likely that most would want to run a high-cost ticketed event” instead. They compare this option with Spring Cycle & the Sydney Running Festival but they are different. Those events are held on the land by the event’s organisers. Sydney NYE is held mostly on and above Sydney Harbour – not in the North Sydney Council vantage points and those vantage points are managed by North Sydney Council – not Sydney NYE’s organiser, the City Of Sydney. An exception to this is North Sydney Council’s Bradfield Park & Mary Booth Lookout, which are home to the Sydney Harbour Bridge pylon projection towers for the northern pylons. This option should only be implemented in those 2 vantage points mentioned above and applicable to only corporate organisations who are sponsoring the projections on the northern pylons of the Sydney Harbour Bridge. Community feedback to the New Years Eve consultation is currently being collated. A report on the future of ticketing will be provided to Council in early 2019. The feedback will be included in the report. So I guess we will have to wait & see. Sydney NYE is, though, sadly become less of a public COMMUNITY event and more of a paid ticketed private CORPORATE/COMMERCIAL event. It should be remembered that most of the Sydney Harbour foreshore has houses on it and they are very valuable, most likely owned by millionaires. If you live in NSW and want Sydney NYE vantage points on public land or in publicly-owned venues around Sydney Harbour to remain free of charge, contact your local councillor (if your local government borders with Sydney Harbour) and/or your member of NSW parliament and/or the NSW Minister For Local Government and/or The Environment. Did you mention Hickson Road Reserve earlier? Isn’t that the Sydney NYE Very Important Person (VIP) Viewing Area? Yes and it was. Similar to last year’s cancellation of the Sydney NYE Lord Mayor’s Party, the City Of Sydney have decided to cancel the VIP Viewing Area for reasons unknown but highly likely because priorities lie elsewhere, like with the Lord Mayor’s Party cancellation. This leaves only the Lord Mayor’s Picnic of the Royal Botanic Gardens as the only original official event function left of Sydney NYE. The owners of Hickson Road Reserve, Property NSW, have decided to replicate the VIP Viewing Area with 1 major difference – tickets are no longer free. You have to pay (though the pricing is just to break-even and not to make a profit). This decision makes not much difference to Sydney NYE as Hickson Road Reserve has been an invitation-only ticketed area since 1996 and is one of the 1st few ticketed areas ever organised for the event. This ticketed area, since it was introduced to last year, was also different from all other ticketed vantage points – it was a ticketed vantage point of the official organiser of Sydney NYE, the City Of Sydney. However, now it is paid ticketed, it adds to concerns about the commercialisation of Sydney NYE. The event guides for Sydney NYE2018 – ‘The Pulse Of Sydney’ were released online recently. A notable thing to point out about this year’s event guides is the vantage point map – very high profile vantage points are left off the map. Why? Because they are sold out at the time of publication of the event guides. There are large gaps in the map as a result. It has been a long day but it ends with the sudden & controversial decision to use the Sydney Opera House essentially as a ‘billboard’ to promote the upcoming The Everest horse race, a horse race that, whilst being the richest turf horse race in the world, has only been held once. This is, without a doubt, the most controversial decision in the history of ‘Spectaculars’ in Sydney. Firstly, apologies to all the Sydney Spectaculars followers for not posting any stories and responding to queries received. In the upcoming month, a post will be made about the future of the blog as the past 9 months, we’ve been weighing up what to do with the blog. We will then also respond to the queries received. In any case, this story is too big not to post about. So prepare for the most controversial decision regarding a Sydney Spectacular EVER. Racing New South Wales (NSW) & The Australian Turf Club announce a new horse race, The Everest, which is to be the richest turf horse race in the world with AUD$10,000,000 prize money, which is funded by “subscribers” & the event’s revenue. It is to be run under weight-for-age conditions over 1200 metres on the Royal Randwick Racecourse on the 2nd Saturday of each October. To enter the race, it costs $600,000 depending the result of an expressions of interest process. There are 12 spots available, which can be traded with other horse owners. These 2 quotes emphasise why The Everest was created. Australia’s most iconic race is the Melbourne Cup, first held just under 160 years ago and whilst is one of the richest turf horse races in the world, it’s prize money is $7,300,000. Sydney and Melbourne, the capital cities of the states of NSW & Victoria and the largest and 2nd largest cities in Australia respectively have long held a sporting rivalry. The barrier draw for the 1st edition of The Everest is held on a boat in Sydney Harbour’s Farm Cove. The Everest is held for the 1st time won by Redzel. 33,000 people attended compared to the Melbourne Cup‘s attendance of approximately 90,000, which was held just under a month later. The Sydney Morning Herald reports that the parliamentary leader of the NSW Labor Party said that, if his political party wins next year’s (2019) state election (to be held on the 23rd of March), they will allow on the Sunday prior to the race, the Sydney Harbour Bridge to be closed and used for the barrier draw for The Everest, which would have formed part of new week-long festival centred around The Everest. The article also mentioned that The Everest from 2019 might be held on a Friday night instead. Closing the Sydney Harbour Bridge, home of one of Australia’s busiest and critical motorways, for an event like a barrier draw would have been unjustifiably disruptive. After all, the barrier draw held a week prior to the article’s publication was held on a boat on Sydney Harbour’s Farm Cove, which is in front of the Sydney Opera House and Harbour Bridge. It was also televised globally. That was in an iconic location with the benefits outweighing the costs. Closing the Sydney Harbour Bridge would’ve undoubtedly have the costs outweigh the benefits. Closing the Sydney Harbour Bridge has been done before but for more realistic events like protest marches, fireworks displays, Formula 1 car driving and historic commemorations but nothing that is nearly equivalent to a simple lottery draw that can be held in a smaller location with an equally iconic view. It is likely this is what has sparked the current situation particularly due to the state election to be held in just under 6 months. Friction in the Federal Parliamentary Liberal Party leads to Prime Minister (at the time) Malcolm Turnbull (Leader of that parliamentary political party) to call a spill at a party meeting, which he subsequently wins but upon receipt of a petition containing a majority of signatures of party members, another extraordinary meeting was held where he resigned the parliamentary political party leadership. He later resigned as Prime Minister. Scott Morrison subsequently got elected by the party and appointed by the Governor-General to each of those positions respectively. Alan Jones, a radio broadcaster, revealed to the Australian Broadcasting Corporation’s 7:30 program that he contacted 2 Members Of Parliament (MP) during the Federal Parliamentary Liberal Party leadership spills that occurred earlier that month. Though one of the MPs is a friend of Alan Jones, the other likely isn’t particularly as he refused to name who that MP was. Access to MPs from their electors is extremely hard to get due to their busy schedule and to have such direct access during such extraordinary times questions how much influence he has over the current Coalition Government & in particular, the Federal Parliamentary Liberal Party. The Daily Telegraph reports that NSW government officials rejected a pitch by Racing NSW to host the barrier draw on the side of Sydney Harbour Bridge without disrupting traffic sometime ago. Clearly, from that, at some point, the NSW Labor Party’s plan (if it was initially their plan) was heard about by Racing NSW who proposed it to the NSW Government for the 2018 edition of The Everest. However, it was inevitably realised that closing the Sydney Harbour Bridge was never going to be an option so a projection show on the Sydney Harbour Bridge pylons became the newer option. However, for some unknown reason, that more logical idea was rejected by NSW Government officials but, as compensation, offered Racing NSW to use the Sydney Opera House instead. Negotiations then begun (sometime before mid-August as per the Sydney Opera House’s Sail Illumination Policy) between the NSW Government, Racing NSW & the Sydney Opera House Trust, which were still going at this point, to hold an hour long projection show on the Sydney Opera House next Tuesday (9th of October 2018) as part of the barrier draw. It was to be “designed alongside the company behind the renowned Vivid festival”. Vivid Sydney has always been organised by Destination NSW, the NSW Government’s tourism agency. The Lighting Of The Sails, though, has been designed by numerous companies over the event’s history. The projection show would coincide with the barrier draw, which lasts 5 minutes and show the names and colours of the 12 horses. For 55 minutes after the projection show, the horses’ colours would be shown. The Everest logo would also be shown the projection show, which would be recorded and used in promotional material all around the world. The negotiations were mediated by the Sports Minister, Stuart Ayres, but the Sydney Opera House Trust kept refusing to allow the projection show. The night prior to the article’s publication saw Racing NSW agreed to remove The Everest logo from the images to be used and instead replace it with a trophy. Alan Jones refers to ‘rugby’ in the interview. He is referring to the usage of the Sydney Opera House for the Wallabies logo during the 2015 Rugby World Cup, which wasn’t held in Australia. However, it was held at the time of the projection, which lasted a few nights. This isn’t promotion for a future event though as the event was occurring at the time of the projection. According to Stuart Ayres at the time, it was used “to cheer the team on” and “to celebrate the Wallabies”. What that means is when people come along and say ‘I want to advertise Chicken Tonight on the sails,’ we can hold firm because we never approve that. If we said yes to this, ‘we’re fine put the Everest logo on there’ our policy is worthless to us, we’re just going to allow whoever comes along to use the Opera House as a billboard,’ we would lose our World Heritage status. We would be seen in the global community as not respecting this jewel, this masterpiece of human creative genius that is the greatest building of the 20th Century. Well what can you say? Just so inappropriate. I feel very supported by the board, I feel very supported by the government, and I feel very supported by the community. I wouldn’t feel that supported by Alan Jones, but by the rest I certainly do. The Sydney Morning Herald claims Luke Foley, the parliamentary leader of the NSW Labor Party, supports the proposal. The Sydney Morning Herald reports the NSW Government will instruct the Sydney Opera House Trust to agree with the proposal (including the trophy amendment). However, some more amendments are to be made, the word ‘Everest’ will be added but not the list of the participating horses. We are very grateful to the NSW Government and Sydney Opera House for their support. We look forward to promoting Sydney internationally via the world’s richest race on turf – The Everest. The instruction will come from the NSW Arts Minister, Don Harwin, who the Herald understands to be disappointed with the decision. To the Herald, a spokesman for the NSW Premier said “of course” Ms Herron had her support, but would not answer whether the Premier had spoken to Alan Jones that day. During the interview, Alan Jones said he will be speaking with the NSW Premier in “5, 3 minutes”, which was after when his show concluded. Requests for illumination of the Sails may come from time to time from Government to promote special events or encourage tourism. These requests will be responded to positively while maintaining the Trust’s policy of non-exploitation of the Sails. It is the last 10 words of that policy section that is currently contentious – “while maintaining the Trust’s policy of non-exploitation of the Sails”. The Everest is a ‘special event’ though and does ‘encourage tourism’ and based on that quote above, the Government can request but not instruct the Sydney Opera House CEO to accept this proposal. The Sydney Opera House CEO will respond positively but only if it doesn’t exploit the Sails. This has all been done. The policy linked to this article is from 2012. It went under review in 2014 so we can’t be certain if it is the same but it is very likely the same. So who is in the right? The Sydney Opera House Trust or The Everest organisers? You can be the judge. In the exercise and discharge of its powers, authorities, duties and functions the Trust shall, notwithstanding anything contained in this Act, be subject to the control and direction of the Minister. The bigger story out of this is the influence of media figures in politics particularly in light of the recent Liberal Party leadership spill, which saw a change in Prime Minister (and several other ministers – well nearly all ministers) as well as the resignation from the Australian Parliament of Malcolm Turnbull.